Liver cirrhosis is an irreversible liver condition. By the time liver disease progresses to cirrhosis, this is often the later stage and treatment options are limited. Alcohol and viral hepatitis B and C are the most common causes of cirrhosis. Cirrhosis may cause weakness, loss of appetite, easy bruising, yellowing of the skin (jaundice), itching, and fatigue. There are actually over 100 different types of liver disease which can impact the function of the liver. The liver is the only organ in the body with regenerative capabilities. The liver has many different roles, like purifying the blood, detoxing the body, aiding in digestion, and storing essential nutrients – just to name a few. Although the liver typically isn’t many people’s concern, it should be because it really is a crucial organ. Everything we ingest, at some point, passes through the liver, so being mindful of what we take in is important for optimal liver health. Cirrhosis occurs after fibrosis, which is the scarring of the liver. It is an advanced stage of liver disease, so by the time you receive a diagnosis of cirrhosis, most of the damage has already been done. As scar tissue continues to develop, the liver’s ability to perform its many functions deteriorates, making you quite sick. Cirrhosis is a response to scarring on the liver – fibrosis. In an attempt to heal itself, the liver produces scar tissue. A buildup of scar tissue leads to a deterioration of liver function. Some of these causes are inherited, other stand alone, and in some people, it is a combination of two or more factors. If through your routine check-up, signs of liver problems arise, then your doctor will recommend you undergo other laboratory tests to better determine the function of your liver. Laboratory tests to diagnose liver cirrhosis include liver function tests by checking your blood for excess bilirubin along with other enzymes that could indicate liver damage, kidney function tests to check for levels of creatinine in the blood, testing for hepatitis virus in the blood, and your body’s ratio of international normalized ratio (INR), as it reveals your body’s ability to clot blood which could indicate liver problems as well. Imaging tests are also helpful in diagnosing liver cirrhosis. Such tests include MRI or transient elastography, CT scans, and a biopsy of tissue from the liver to confirm diagnosis and determine severity and extent of illness. If caught early, cirrhosis is treatable. Typically, in order to best treat cirrhosis, the cause of the disease must be dealt with. This can refer to treating hepatitis, cessation of alcohol or drug use, or treating a parasite. Complications linked with cirrhosis also need to be treated. This can involve releasing excess fluid from the body, managing blood pressure, treating cirrhosis-related infections, and taking medications to reduce toxins in the body. If cirrhosis is severe, a liver transplant is required. Cirrhosis is not inevitable, and you can start taking steps to protect your liver and prevent cirrhosis. Limit or cut out alcohol: Alcohol isn’t just linked with cirrhosis, it can also play an overall role in poor liver function. Choose a healthy diet to promote liver function as well: Steer clear of fatty, fried foods and stick with fruits, vegetables, and lean meats. Note that red meat takes longer to break down in the liver. Maintain a healthy weight: Some forms of liver disease, including cirrhosis, are linked with fat accumulation. Reduce your risk of developing hepatitis: Do not share needles, ensure you are vaccinated, and be aware of the risk of hepatitis when traveling to foreign countries. Avoid infections: Cirrhosis makes it difficult to fight off infections. Avoid people who are sick and wash your hands frequently. Eat a low-sodium diet: High sodium can cause your body to retain fluids, worsening swelling in your abdomen and legs. Use herbs for seasoning your food, rather than salt. Choose prepared foods that are low in sodium. Studies have shown that aerobic exercises can help improve liver function, and in liver cirrhosis, liver function declines. Therefore, a good way to slow down the progression of liver cirrhosis is to exercise. Aerobic exercise: Aerobic exercise helps the production of the hormone adiponectin, which works to curb insulin resistance. Fatty deposits in the liver can further progress liver disease and cirrhosis, so preventing this from occurring can help maintain liver function. Walking: One of the simplest exercises you can perform, walking is another example of an aerobic exercise which we now know can improve liver function by preventing the build-up of fatty deposits. Strength training: Lifting weights helps burn more fat, which means it is less likely to accumulate in your liver. Core workouts—Yoga and Pilates: Your liver is located in your abdomen region, and when fat accumulates around your abdomen, it can deposit into your liver, causing further disease progression. Therefore, it’s important that you reduce abdomen fat, and core exercises such as yoga and Pilates can help you achieve that. Dancing: Dancing is not only fun, but it’s a great way to stay active and burn fat. You can dance on your own or join popular dance fitness classes. 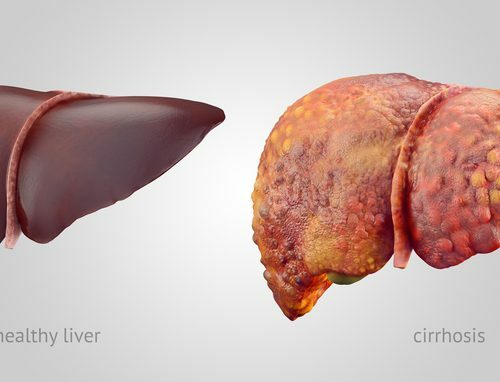 The important takeaway here is that most cases of liver cirrhosis are preventable as long as you adhere to a healthy lifestyle, which includes maintaining a healthy weight, regular exercise, eating healthy, reducing stress, not smoking, and moderating your alcohol consumption.